Am I the Bryanboy of magazine blogging? 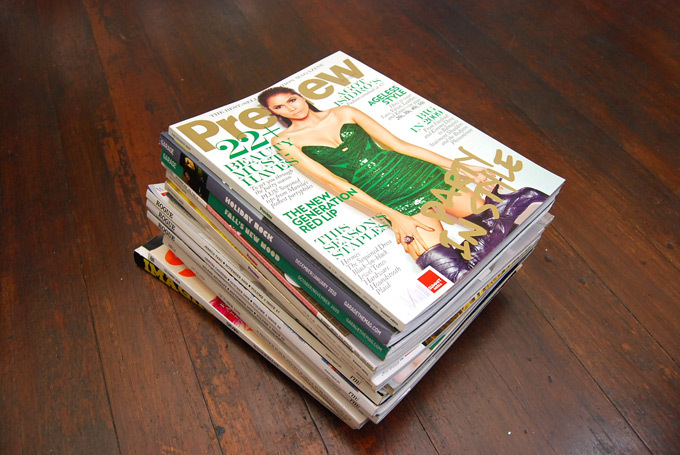 Lots of magazines, so little blogging time. One more week 'til vacation sweet vacation! Grabe, just a few more weeks days and it's twenty-ten oledi. And oh, PS: I got Preview December yesterday (weee!) but how sad—it did not come with the Nokia x Preview x Slims supplement thing. WT? I already asked about it and they mag people of FB will contact me as soon as they get details. I vreally want that supplement so goodluck nalang x10! "Am I the Bryanboy of magazine blogging?" --> You are you are!!! Haha! If had more time too, i'd be blogging about magazines everyday! (ambisyosa!) Keep it up edrick and happy holidays!!! i haven't bought the dec preview yet. gosh... haha. i kinda don't like the cover. haha. @mike: i didnt buy it too! ---> eeevill pero if edrick says the eds are good then im off! @edrick: Agree! More ferokk = the cover that didnt make it! And this: Jinkee Pacquiao is the Jan Feb covergirl! Whapakman! LOL! i am feeeeeeling your excitement my deeeeeear!!! a very happy new year to us! yes! haha happy new year!